WANG, Sicheng: Optimization and Simulation of the Flow of Passengers Based on Time Series Analysis, pp. 5-19. AVERIAN, Alexandru: A Survey on Context Aware Computing in Digital Ecosystems, pp. 21-40. DUMITRU, Dan: Particular Cases of Special Robertson-Walker Multiply Warped Products Having an Affine Connection, pp. 41-56. CHIRANA-GHEORGHIȚĂ, Eugeniu-Theodor; IACOB, Nicoleta Magdalena: An Alternative Solution to AMAZON Software Defined Object Storage, pp. 5-10. GURA, Claudiu; IACOB, Nicoleta Magdalena: Open Source Alternatives for Enterprise Databases, pp. 11-17. IACOB, Nicoleta Magdalena: Concurrency Control in Distributed Database Systems, pp. 19-24. IACOB, Nicoleta Magdalena, DEFTA, Costinela-Luminița: Application Firewall Security for Web and SQL Services, pp. 25-30. MOHAMMED SAEED, Ali Amer: On Measuring the Intelligence Level of Knowledge Representation and Processing Systems, pp. 31-38. DEFTA, Costinela-Luminița; IACOB, Nicoleta Magdalena: Role of Threshold Cryptography in MANET Security, pp. 39-45. DUMITRU, Dan: Particular Cases of Special Robertson-Walker Multiply Warped Products with a Semi-Symmetric Connection, pp. 47-55. MOHAMMED SAEED, Ali Amer: Recent Approaches in Knowledge Representation, pp. 5-12. STERIAN, Alexandru: Moduli Spaces of Rank-3 Vector Bundles on Hirzebruch Surfaces with c1 = σ+2f, pp. 13-23. PAVEL, Alexandru: Developing Mobile Applications for Modern Smartphones, pp. 25-30. DUMITRU, Dan: Contraction-Type Functions and Some Applications to GIIFS, pp. 31-44. ALBEANU, Grigore: On Computationalism. The Evolution of Scientific and Technical Ideas, pp. 45-50. MOHAMMED SAEED, Ali Amer: Traditional Approaches in Knowledge Represention, pp. 5-16. STERIAN, Alexandru: Moduli spaces of rank 3-stable vector bundles on Hirzebruch surfaces with c1 = σ, pp. 17-32. DUMITRU, Dan: Remarks on Robertson-Walker warped products equations, pp. 33-46. COPIL, Vlad; IOAN, Rodica: A Brief History of the Life and Work of Nicolaus Copernicus, pp. 47-50. COPIL, Vlad; IOAN, Rodica: 150 Years from the Birth of a Great Mathematician - Jacques Salomon Hadamard, pp. 51-64. POPÎRLAN, Cristina: Iterative Method for Large Linear Systems, pp. 5-10. STAN, Aurel I.: A Characterization of q-Gaussian Random Variables in Terms of a Wick Product Identity, pp. 11-30. CHIŢESCU, Ion: The structure of λ-Measures on the Code Space, pp. 31-38. BÂRZĂ, Silviu: Some Considerations About Component p-vertexes Complete Subgraph, pp. 39-48. DUMITRU, Dan: A Remark on Linear Codes, pp. 49-53. DINCĂ, Sorin, POPÎRLAN, Claudiu Ionuţ: Developing a System of Knowledge Bases Using Semantic Schemas in Java and CLIPS, pp. 5-14. CHIŢESCU, Ion: Parametric Continuity of Choquet and Sugeno Integrals, pp. 15-38. BÂRZĂ, Silviu: 0-1 Algebraic Approach Algorithm for the Determination of Component Minimal Complete Subgraph, pp. 39-50. ALBEANU, Grigore: Neutrosophic Computational Models - II, pp. 51-56. BÂRZĂ, Silviu: A Better Sets Approach Algorithm for the Determination of Component Minimal Complete Subgraph, pp. 5-12. BÂRZĂ, Silviu: Probability for the Existence of the Solutions for Constant Sum Integer Programming, pp. 13-21. DINCĂ, Sorin: Using Client-Server Technology to Query Knowledge Bases in Natural Language, pp. 23-31. COPIL, Vlad; IOAN, Rodica: A Brief History of Catalan's Conjecture, pp. 33-36. AVERIAN, Alexandru: Digital Ecosystems Software Modeling from a Niche Perspective, pp. 37-47. POIENARIU, Mihaela; CHIROIU, Veturia: Composite Materials Inspired by Nature, pp. 49-59. ENESCU, Marian: Subjective Risk Analysis Approaches of LCP, pp. 5-12. ALBEANU, Grigore: Neutrosophic Computational Models - I, pp. 13-22. ENESCU, Marian: Computer Aided Risk Management of Large Combustion Plants, pp. 23-30. ALBEANU, Grigore, BURTSCHY, Bernard, POPENŢIU-VLĂDICESCU, Florin: Soft Computing Strategies in Multiobjective Optimization, pp. 31-38. BUCEA-MANEA-TONIS, Rocsana, BUCEA-MANEA-TONIS, Radu: Marketing Simulation - Reducing the Transport Cost for Commercial Agents, pp. 39-46. Dumitru, Dan: About Generalized Quasi-Einstein Spaces, pp. 47-52. Dumitru, Dan: A Characterization of Einstein Spaces, pp. 53-55. VĂDUVA, Ion: On Simulation Some Life Data Distributions, pp. 5-16. CHIŢESCU, Ion: The Formula of Faà di Bruno: Old and New, pp. 17-26. DINICĂ, Maria; DINESCU, Luminiţa: Modern Perspectives of Using the Computer in Teaching Physics, pp. 27-36. MOISE, Luminiţa Dominica; CRISTEA, Ruxandra: Confluence Between Higher Secondary and Universitary Educational System. Approach Based on Projects in Virtual Space, pp. 37-44. VÎRGOLICI, Horia: On the Exponential Diophantine Equation x2 + D = yn: a brief survey, pp. 45-54. DUMITRU, Dan: On the connectedness properties of the attractors of iterated function systems, pp. 55-64. BÂRZĂ, Silviu: Sets Approach Algorithms for Determination of Component Minimal Complete Subgraph, pp. 65-72. BÂRZĂ, Silviu: Some Characterizations on Clustering Using Equivalent Graphs, pp. 73-78. Sterian, Alexandru: A geometric proof of a non-vanishing theorem on Del Pezzo variety Vn, pp. 5-10. Dumitru, Dan: Attractors of topological iterated function system, pp. 11-16. Loyola Y Blanco, José: Modeling a Virtual Learning Environment as States of a Touring Machine, pp. 17-26. Loyola Y Blanco, José,: A digital pedagogy model, pp. 27-40. Bârză, Silviu: Some Consideration About Component Minimal Complete Subgraph, pp. 41-50. Bârză, Silviu: Equivalent and Strong Equivalent Graphs with Application in Clustering, pp. 51-58. Ilea Mihai, Turnea Marius: Stiff equation with application in ovarian cancer diseases, pp. 5-16. Turnea Marius, Ilea Mihai, Rotariu Mariana: Stiff equation with application in physiological excitable systems, pp. 17-22. Dumitru Dan: Generalized Quasi-Einstein warped products, pp. 23-30. Săraru, Corina; State, Luminiţa,: Optimized classifier design using wavelets and independent component analysis feature extraction for support vector machines, pp. 31-38. Bârză, Silviu: Determination of the number of isomorphic graphs with diagonal cell type walks matrix, pp. 39-48. Poienariu Mihaela, Ioan Rodica: On the self-organizing pattern with application to smart materials, pp. 49-58. Georgescu Migdonia, Munteanu Ligia: On the dynamics of timber structures subjected to wind actions, pp. 59-66. Vîrgolici Horia: On the exponential diophantine equation px+1009y=2z, pp. 67-70. Stanciu Laura Filofteia, Breaz Daniel: Some univalence conditions for a family of integral operators, pp. 71-78. Vîrgolici, Horia: On the Exponential Diophantine Equation 2x+1009y=pz, pp. 5-10. Bârză, Silviu: Number of Isomorphic Graphs with the Same Diagonal Cell Type Walks Matrix, pp. 11-18. Grădinaru, Stelian: Pairs of Glauert Integrals, pp. 19-24. Săraru, Corina; State, Luminiţa,: Optimized Classifier Design Using Wavelets and Independent Component Analysis Feature Extraction for Support Vector Machines, pp. 25-30. Becheru, Petru-Ioan: Correcting Romanian Typesetting Mistakes by Using Regular Expressions, pp. 31-36. Fazlollahtabar, Hamed; Abbasi, Ali: Heuristic Probabilistic Approach for Prioritizing Optimal Course Delivery Policies in E-Learning Systems, pp. 37-52. Anastasiu Popescu, Doru: Measuring the Quality of the Navigation in Web Sites Using the Cloning Relation, pp. 5-10. Paliokas, Ioannis: Towards Massively Multistudent Online Cloud Learning Environment (MMCLE), pp. 11-20. Dumitru, Dan: On Compact Einstein Warped Products, pp. 21-26. Paraschiv-Munteanu, Iuliana; State, LuminiÅ£a: Classification Using Kernel SVM, pp. 27-32. Sticlaru, Gabriel: Counting Solutions to Some Polynomial Equations Over Finite Fields, pp. 33-44. Fazlollahtabar, Hamed; Hajmohammadi, Hamed: Reliability Assessment of Users’ Virtual Learning Queue System, pp. 45-52. Albeanu, Grigore; Vlada, Marin: New Results on E-Learning Methodologies, pp. 5-6. Chen, Zhengxin: Rethinking Thinking: Using Ontologies for E-Technology Enabled Integrated Problem Solving, pp. 7-14. Allegra, Mario; La Guardia Dario; Gentile, Manuel; Taibi, Davide; Fulantelli, Giovanni: A Digital Game Approach for Entrepreneurial Mindsets, pp. 15-22. Divena, Snejana: A Study on Students` Views on Blended Learning Environment Usage, pp. 23-30. Abstract, Răileanu Elena: Metasystems Approach to Research the Globalisated Pedagogical Processes, pp. 31-50. Gentile, Manuel; Fulantelli, Giovanni; Taibi, Davide; Allegra Mario: Towards the Learning Object Management System and Dynamic Use of Metadata, pp. 51-58. Kitagaki, Ikuo: E-Learning for English Language Speaking Skill, pp. 59-67. Răileanu Elena: The E-Learning Structure - Context Methodology, pp. 68-72. Taibi, Davide; Gentile, Manuel; Fulantelli, Giovanni; Allegra, Mario: Collaborative Creation of Open Educational Resources: Teachers in the Net Generation, pp. 73-82. Stănescu, Ioana; Ştefan, Antoniu; Hamza-Lup, G. Felix; Ştefan, Veronica: Simulation and Haptic-Enabled Frameworks for Virtual Learning Environments, pp. 83-89. Awad, Abdelkarim; Ghanem, Wasel: Computer Organization: Hardware Description Language Approach, pp. 90-98. Ghica, Manuela: Approximate Saddle Points Portfolios, pp. 5-10. Dumitru, Dan: Connectedness of the Attractors of Iterated Function Systems, pp. 11-18. Vîrgolici, Horia: On the Exponential Diophantine Equation, pp. 19-22. Vornicescu, Neculae: Approximation of Functions of Two Variables by Discrete Linear Positive Operators, pp. 23-32. Albeanu, Grigore; Madsen, Henrik; Popenţiu-Vlădicescu Florin; Dumitru, Marius: On Designing Extendable Java-based Software for Time Series Analysis, pp. 33-40. Sticlaru, Gabriel: Algebraic Statistics: Some Applications, pp. 41-54. Păunescu, Luminiţa; Curculescu, Bogdan Ionuţ: Information Security through Wireless Technology, pp. 55-69. Popescu, Ion; Albeanu, Grigore: Mathematical Modelling in Business, Environment and Computer Science, pp. 5-6. Miscoi, Gheorghe; Popescu, Ion; Ungureanu, Laura; Matei, Ion Viorel; Velter, Victor: On Interdisciplinary Approach of Economic Reality, pp. 7-10. Burtschy, Bernard; Albeanu, Grigore; Popentiu-Vladicescu, Florin: Time Series Forecasting in Software Reliability by Fuzzy Nearest Neighbour Method, pp. 11-14. Albeanu, Grigore; Madsen Henrik; Ghica, Manuela; Popentiu-Vladicescu, Florin: Bootstrap Intensive Methods for Understanding Empirical Loss Data and Dynamic Financial Analysis, pp. 15-20. Madsen, Henrik; Popentiu-Vladicescu, Florin; Albeanu, Grigore: Queueing Models for Computing Systems Management and Maintenance, pp. 21-26. Albeanu, Grigore; Burtschy, Bernard; Popentiu-Vladicescu, Florin: Uncertainty Estimation by Bootstrap Approach, pp. 27-30. Miscoi, Gheorghe; Popescu Ion; Albeanu, Grigore; Manuela Ghica: On Teaching Statistics and Econometrics Using Modern ICT Methodologies, pp. 31-34. Albeanu, Grigore; Burtschy, Bernard; Popentiu-Vladicescu, Florin; Ghica, Manuela: Bootstrap Simulation Models in Environmental Economics, pp. 35-44. Miscoi, Gheorghe, Ioan, Rodica; Albeanu, Grigore: Bootstrap Simulation Models for Indirect Measurement Estimation, pp. 45-54. Nicola, Ileana Rodica: Hopf bifurcations for a time-delayed cancer cell population model, pp. 5-14. Vîrgolici, Horia: An algorithm for the synthesis of the functions generator cylinder mechanism, pp. 15-18. Ghica, Manuela: ε-Approximate portfolios, pp. 19-30. Dumitru, Dan: Some estimations of the Mandelbrot set, pp. 31-36. Vornicescu, Neculae: A problem in nonlinear optimization, pp. 37-46. Niculescu, Rodica Florentina; Niculescu, Radu Ştefan: A characterization of Directed P-graphs, pp. 47-54. Militaru, Romulus; Călin, Liviu-Adrian; Călugăru George-Cristian; Georgescu, Adrian: Efficient processing of numerical algorithms through Numerical Engineering Software, pp. 55-64. Vîlcu, Dana; Mercier, Giles: Multiprocessor scheduling theory. A short survey, pp. 65-75. Dumitru, Dan: Some generalizations of F-connections on differentiable manifolds, pp. 5-12. Vîrgolici, Horia: An algorithm for the optimal synthesis of a guiding mechanism, pp. 13-22. Bârză, Silviu: Variation of constant sum constraint for integer model with non uniform variables, pp. 23-28. Miu, Lisandra: Different approaches for a linear model for financial portfolio optimization, pp. 29-38. Militaru, Romulus; Călin, Liviu-Adrian; Călugaru, George-Cristian; Georgescu, Adrian: Numerical engineering software, pp. 39-46. Sticlaru, Gabriel; Dan, Radu, Necolae; Ispas, Marius: E-commerce with open source technology: Apache, Php, and Postgresql, pp. 47-56. Albeanu, Grigore; Ţarcă, Cătălin Radu; Popenţiu-Vlădicescu, Florin; Paşc, Ildiko: Interfacing a robot control application with a remote user, pp. 57-62. Copil, Vlad: Relating the Riemann Hypothesis and the primes between two cubes, pp. 5-10. Chiţescu, Ion: A formula concerning symmetric bilinear maps and self adjoint operators, pp. 11-16. Miu, Lisandra; Bârză, Silviu: VaR methodology for currencies risk measurement, pp. 17-26. Averian, Alexandru: Component based systems testing with UML and incorporated contracts, pp. 27-34. Dochiţoiu, Ştefan: Algorithm and program to determine the order of a point on an elliptic curve, pp. 35-42. Tănase, Irina: Software application for activities, clients and contracts management in a life insurance company, pp. 43-48. Sticlaru, Gabriel: C++ classes to model financial instruments, pp. 49-56. Rozoveanu, Petru: The Clarke's subdifferential for vector valuated functions, pp. 57-76. Rozoveanu, Petru: A Perron-Frobenius theorem for nonlinear operators, pp. 77-90. Rodica Trandafir: Spiru Haret - om de ştiinţă / Spiru Haret Scientist, pp. 5-8. 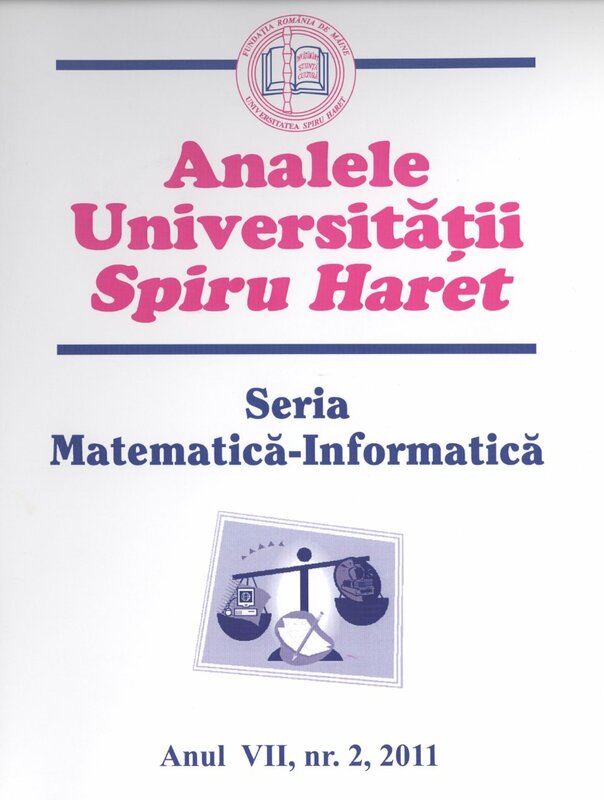 Ştefan Costea: Spiru Haret, Sociologia matematică şi sociometria / Spiru Haret, Mathematical Sociology and Sociometrics, pp. 9-12. Gabriel Dumitriu: Asupra implementării unui simulator generic / On the Implementation of a Generic Simulator, pp. 13-22. Argus Adrian Dunca: O nouă tehnică de filtrare pentru simularea numerică a fluidelor turbulente / A New Filtering Technique for the Turbulent Flows' Numerical Simulation, pp. 23-30. Aurora Baciu: Limbaje Leontief probabiliste / Probabilistic Leontief Languages, pp. 31-34. Silviu Bârză: Modele întregi cu sumă constantă şi variabile cu domeniu uniform / Constant Sum Integer Models with Uniform Domain Variables, pp. 35-40. Antonela Gonciulea: Determinarea coeficienţilor omogenizaţi pentru o ecuaţie de tip eliptic / Homogenized Coefficients Determination for an Elliptic Equation, pp. 41-50. Manuela Ghica: Portofolii optime în finanţe şi actuariat / Optimal Portfolios in Finance and Actuarial Science, pp. 51-58. Luciana Maria Morogan: Codificarea Informaţiei în noile modele de calcul. Calcul bazat pe ADN şi calculul cu membrane celulare / Information Coding in the new Computational Models. DNA based Computing and Membrane Computing, pp. 59-72. Rodica Trandafir: Valori medii ale unor variabile aleatoare din planul euclidian E2 / Mean Values for Euclidian E2 Random Variables, pp. 73-78. Gabriel Sticlaru: Dezvoltarea unui sistem de tranzacţionare / The Development of a Transactional System, pp. 79-88. Florentina-Rodica Niculescu, Radu-Ştefan Niculescu: Extinderi ale noţiunii de P-graf relativ la grafuri neorientate / P-graph Extensions for Non-directed Graphs, pp. 89-108. Aurora Baciu: Gramatici contextuale R-fuzzy / R-fuzzy contextual grammars, pp. 5-12. Marin Popa, Mariana Popa: Invarianţi şi S-invarianţi într-o PT-reţea Petri / Invariants and S-invariants in a marked PT-Petri net, pp. 13-26. Rodica Ioan: Utilizarea metodei perturbaţiilor la rezolvarea problemei tragerii benzilor folosind o teoremă de medie / The problem of strip drawing through a converging die using a local method, pp. 27-36. Lorena Tufan: H*-Algebre / H* - algebra, pp. 37-44. Marina Cidotă: Tehnici predictive în procesarea semnalului vorbit / Prediction techniques for speech processing, pp. 45-56. Gabriel Dimitriu: Asupra utilizării unor mecanisme formale în descrierea proceselor de aşteptare specifice sistemelor client-server / About the utilization of formal languages in the description of the waiting processes specific to the client-server applications, pp. 57-62. Marin Popa, Mariana Popa: Calculul unor măsuri necesare căutării pe web / Computing some measures for WEB search, pp. 63-78.